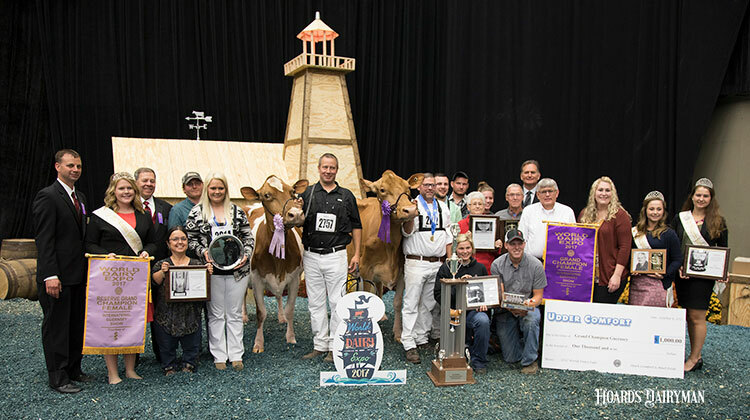 A cow from Ohio returned to the colored to shavings to win the 2017 World Dairy Expo International Guernsey Show. Judge Chris Lahmers tapped Springhill Mentor Jazzy-ET as Grand Champion of the 2017 International Guernsey Show. The 4-year-old cow was exhibited by Springhill Farms of Big Prairie, Ohio. Judge Lahmers said she was long from end to end with great dairy strength. He also pointed out her long fore udder attachment and venation of the mammary system. Jazzy’s awards from the day were many, as she was also named Senior Grand Champion and Best Bred and Owned. Additionally, she was awarded the title of Best Udder. Jazzy has gotten better with age, as she had previously been named Intermediate Champion at the 2016 World Dairy Expo. Reserve Grand Champion and Reserve Senior Champion was Lantz Farm Preppy Indy, owned by Melinda Rushing of Yukon, Okla. She was the winning 6-year-old and older cow. Intermediate Champion was Adams Creek Ap Bianca-ETV, a Junior 2-year-old exhibited by Alyssa Nuttleman of Bangor, Wis. Bianca was also Intermediate Champion of the Open Show and was later named Grand Champion of the Junior Show. It was a big day for Bianca and Alyssa, as the cow was also named Best Bred and Owned of the Junior Show. Bianca has had success on the colored shavings before, as she was named Junior Champion at last year’s show. Reserve Intermediate Champion of the Open Show was the Senior 2-year-old, Milborne HP Kringle Tara, shown by P.M. Miller, Hillpoint Partners, and P. Vail, Granby, Conn. Reserve Intermediate of the Junior Show was Prairie Moon L Abriella-ET, owned by Landon and Leslie Sivesind Waukon, Iowa. She was also from the Senior 2-year-old class. Reserve Grand Champion of the Junior Show was Broke Showtime Taytor, owned by Dana and Madison Sickles, Marengo, Iowa. She was also the Senior Champion of the Junior Show. Reserve Senior Champion of the Junior Show was Knapps Best Buy Tarina, exhibited by Alexis and Frederick Williams, Mable, MInn. Junior Champion was Nicleys HP GG Cordell Annie-ETV, owned by L. Harbaugh, D. Basse, M. Miller, and Hillpoint Partners from Marion, Wis. Reserve Junior Champion was Gr-Dix Lee Royce Starskittles, owned by Justin and Daniel Chupp, India, Okla.
Nicleys HP GG Cordell Annie-ETV was also Junior Champion of the Junior Show. Reserve Junior Champion was Knapps Kringle Tappy-ET, exhibited by Landree Fraley from Muncey, Penn. Premier Breeder and Premier Exhibitor went to Knapp’s Guernseys, Epworth, Iowa. The Premier Sire was Indian Acres American Pie-ET. Judge Lahmers of Marysville, Ohio, and his associate, Bernie Heisner of Fairview Heights, Ill., placed more than 200 Guernseys over the two-day show.